I planned a “hard 6k” for Saturday, anticipating that I would be able to do it on the water, in the single. 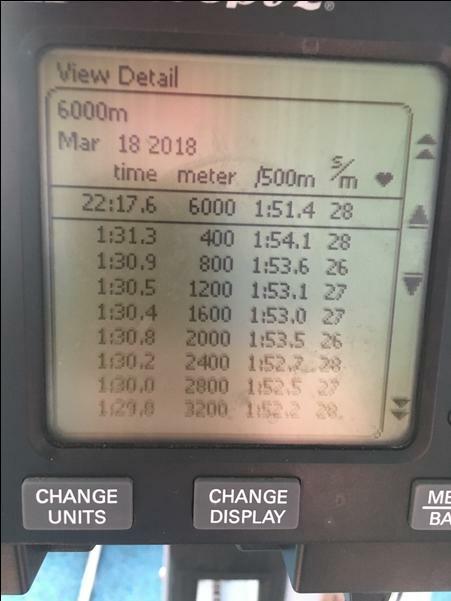 So, although it was supposed to be a hard 6k, I never intended it to be a full out one, this being my first or second OTW row of 2018. It all worked out differently. 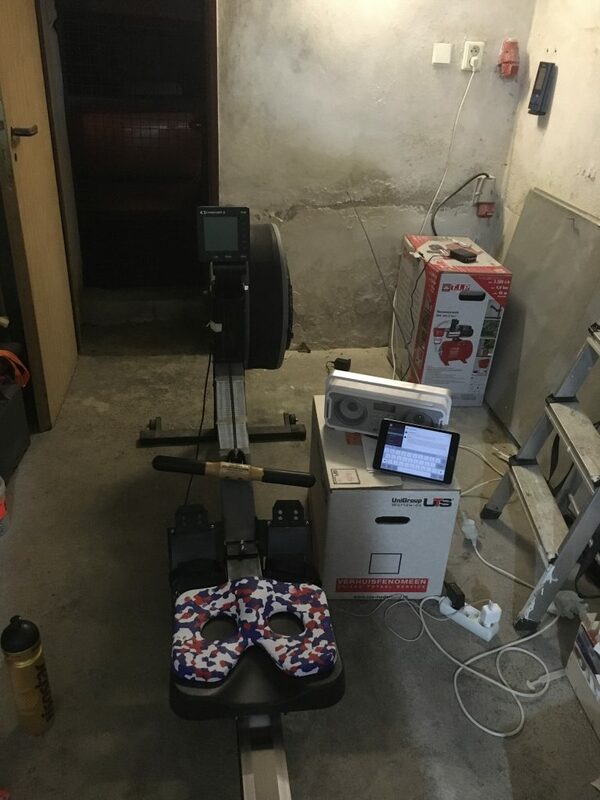 It snowed on Saturday, and I decided to do the Steady State workout on my erg in my basement, and move the 6k to Sunday, when a small group of our Masters rowers meet at the rowing club and erg together. I put the erg on slides, to get a bit closer to the OTW feeling, and, admittedly, also because erging a 6k is so much easier on slides. Did I mention that I am considering buying slides for use at home? I found a local guy who can make them really cost effective. I did a nice long warming up with some speed bumps. It’s easier to rate up on slides, so I found myself doing 40spm for a few strokes. Then, while the rest of the Masters started their 4x8min/2min workout (at 22/24/26/22spm), I started my 6k. The plan was to stick to 1:54 pace for the first 2400m and be careful, but I did see a lot of 1:52 pace, and when I got enthusiastic, even some 1:52 and 1:51. With the other rowers next to me, I didn’t have difficult rating up in the second half of the row. It’s amazing how much peer pressure helps, although I also think that for a lightweight as me, rowing on slides is a definite advantage. Not a bad workout. Actually a Season’s Best, and pretty close to my PB (of 2 years ago) of 22:13.1. 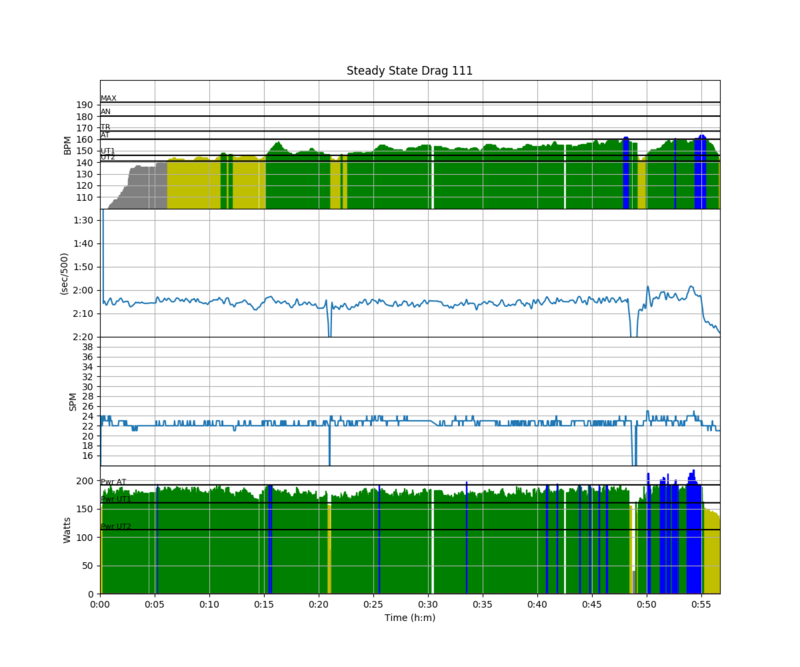 Rowing in our rowing club’s erg room is always a challenge, data wise. 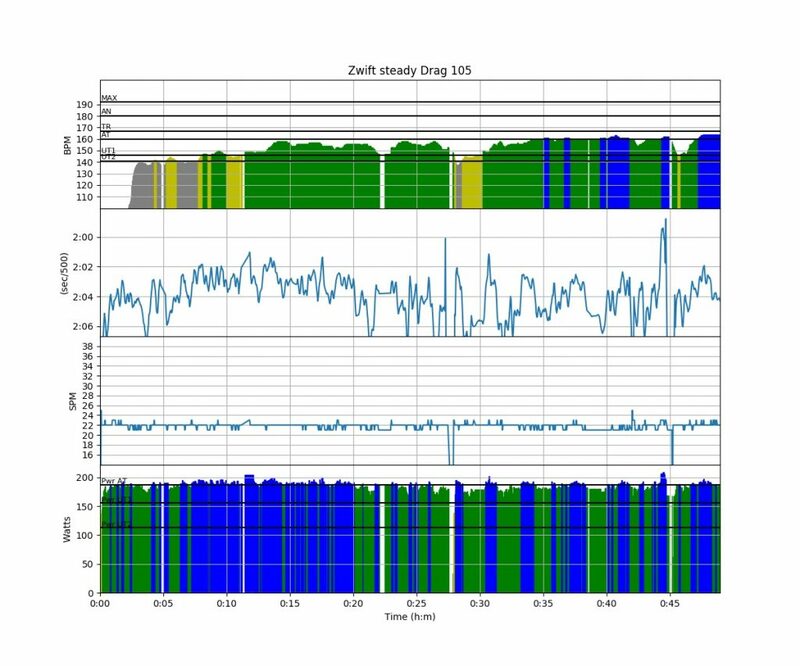 The ergs have PM3 monitors, and no heart rate adapter. To get Painsled to register anything, I need to use the iPhone connection kit plus a lightning to 30 pin adapter to get my iPhone to work with the monitor. I do record heart rate separately, using the Polar OH1 optical heart rate belt worn on my upper arm. This heart rate band has a standalong mode, which syncs to Polar Flow, and then to Strava. 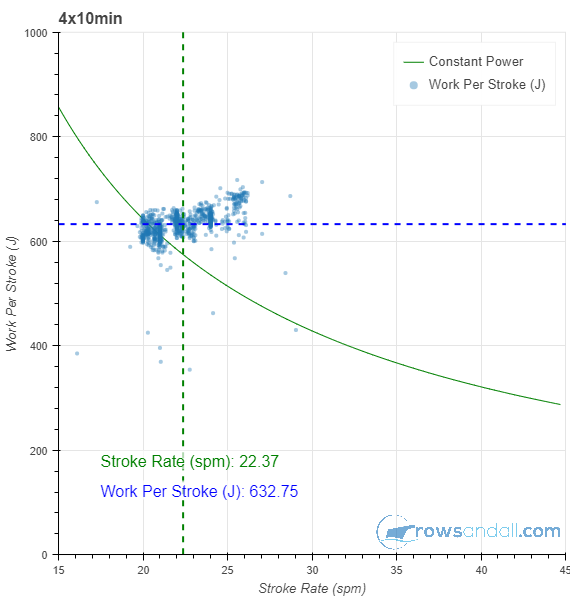 Then, I can import the heart rate data using the Strava connection to rowsandall.com. Before I merge the heart rate data with the rowing data, I first glue warming up, 6k and cooling down together on rowsandall.com, as described here. 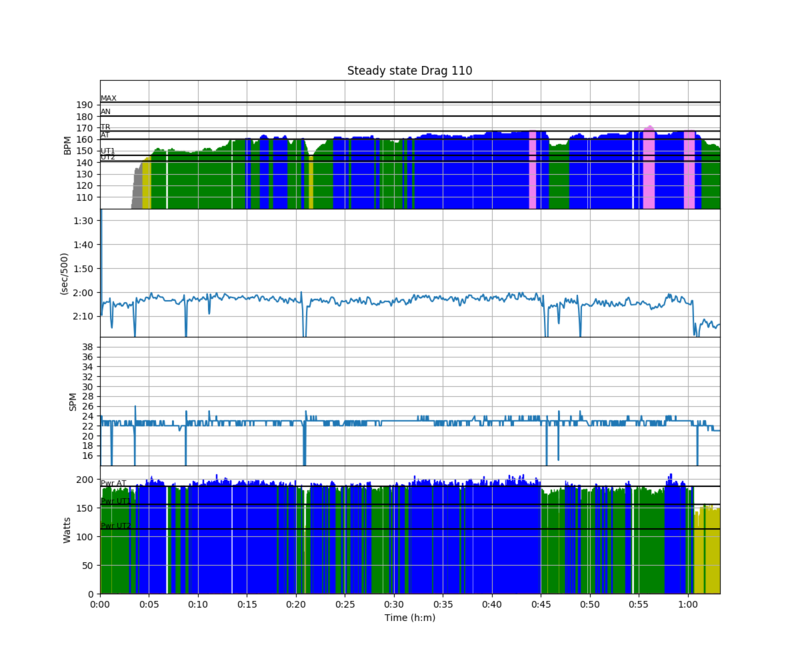 I select heart rate, and as I started the heart rate band at the same time as I started rowing, I don’t need to edit the time offset. If I wanted, I could now split the resulting workout again to get a nice record for my 6k with heart rate, but I didn’t have a need for that. 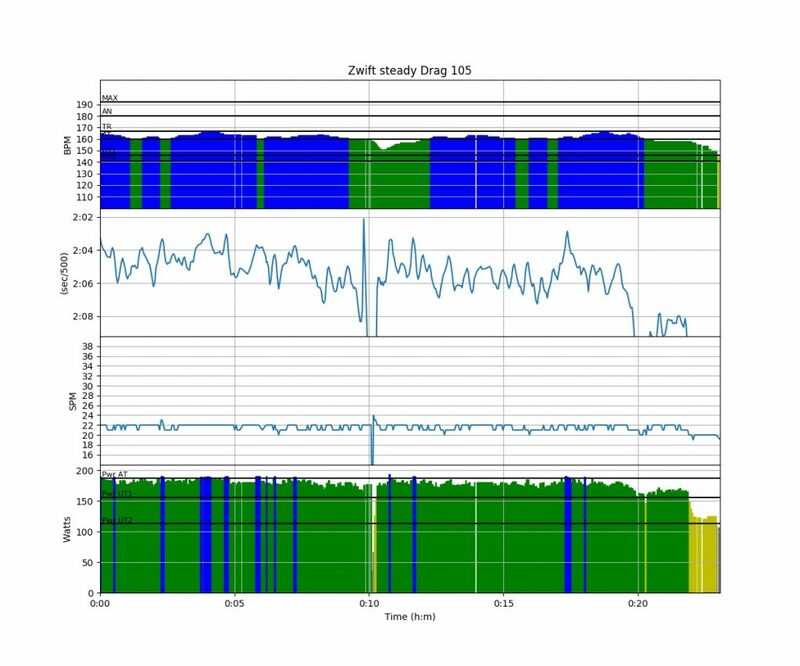 The sensor fusion, joining and splitting are experimental functions on rowsandall.com, and you have to try which approach gives you the best result. 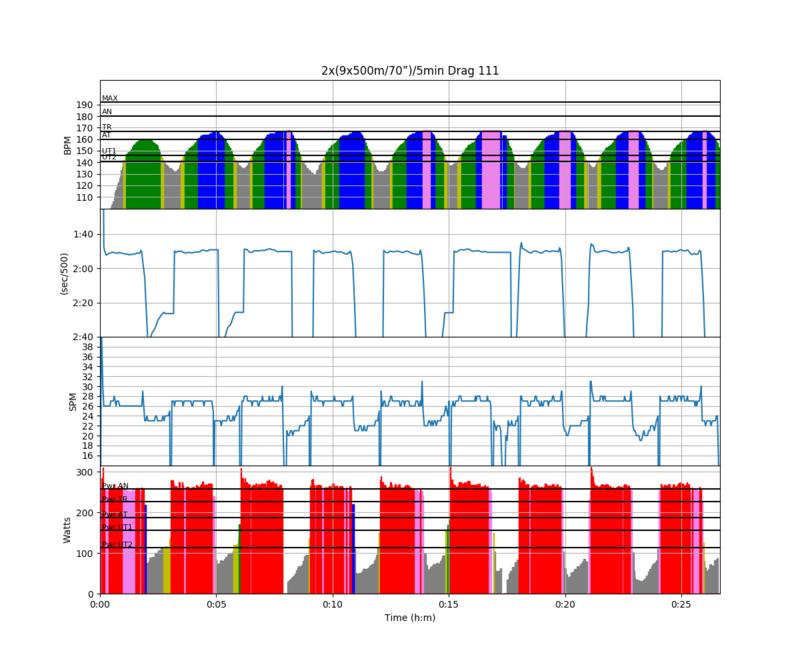 I find that when the workout durations are very different, like today where the OH1 recorded one hour long record, but the painsled workouts where divided in three parts, it is more efficient to first glue together the rows, and do the data fusion with workouts of approximately the same length. That creates a nice workout record for the entire session, which can then be split up again if you want. 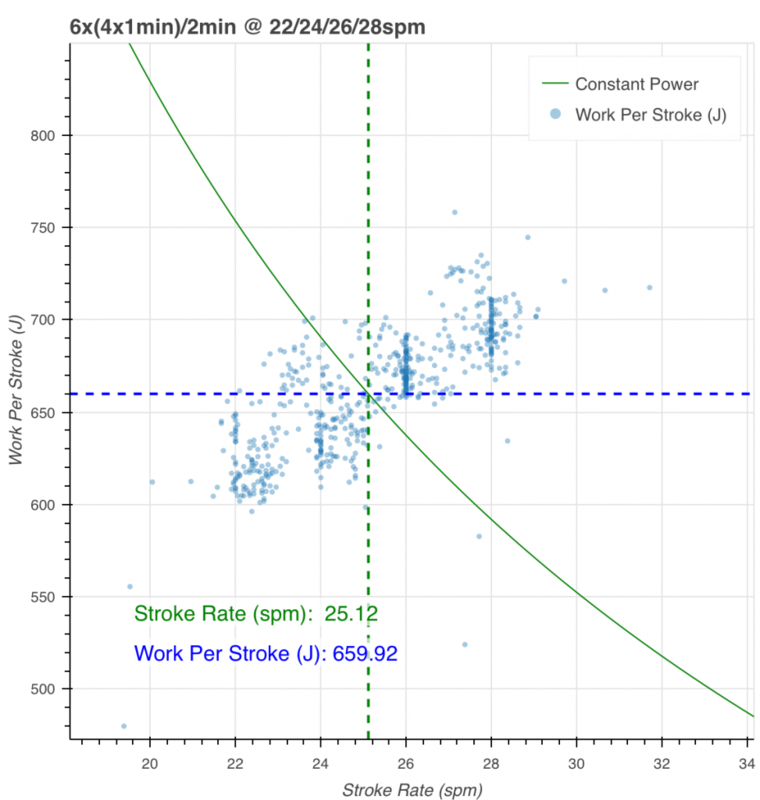 For the stroke metrics plots, I used the original Painsled 6k workout, without heart rate data, and just browsed through my defined set of favorite flex charts, zooming in on stroke length and work per stroke using the flex tools. Pretty happy with what I saw. Just an hour of steady state. In my optimism, I had planned for a “technique row” OTW for Friday. It was below zero, and I skipped training altogether. During this erg row in my basement, it was snowing outside. Everything is white, as if we have been set back three months in time. I used Zwift again (more about that in the how to section below). Here I am riding into the mountains. 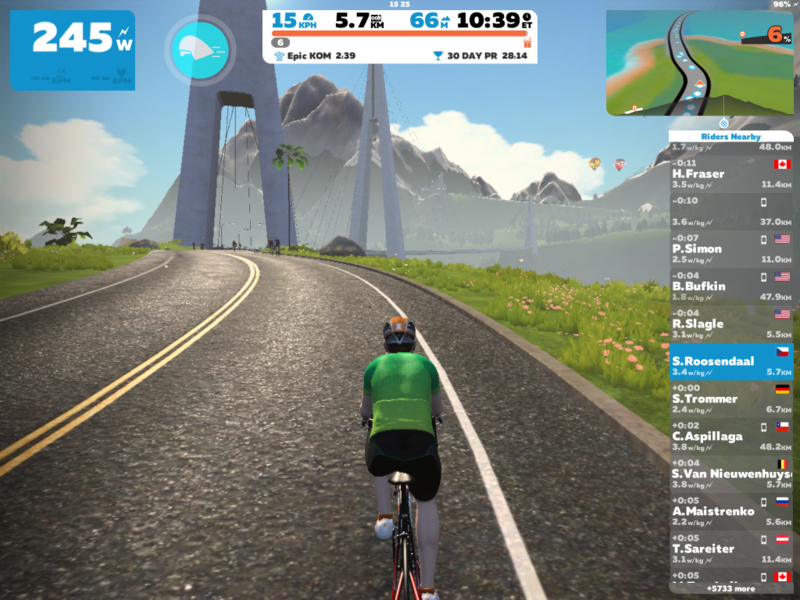 On the iPad, you will see the iPhone running Painsled as a power meter. Connect to that, and your little cyclist avatar will get the power values from the Concept2. 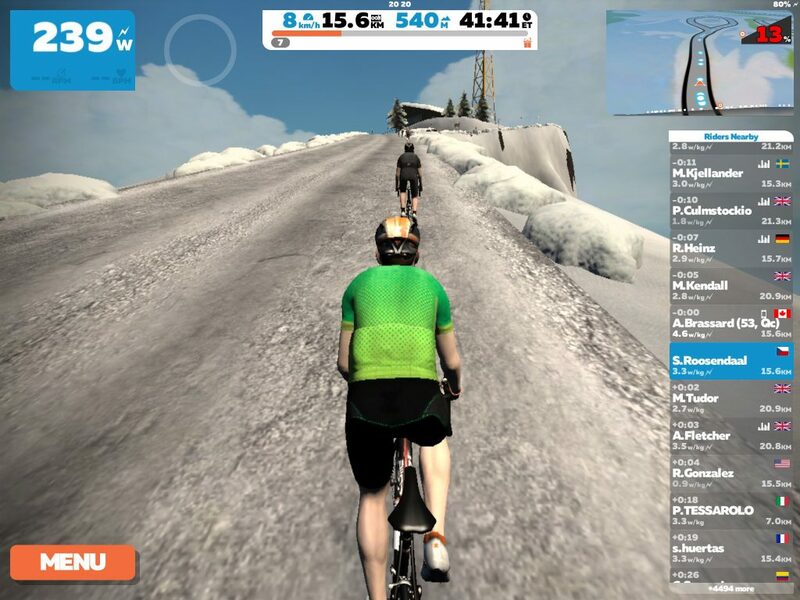 Actually, the power values are upgraded a bit, so while I was doing 200W on the erg, it showed as 235W on Zwift. 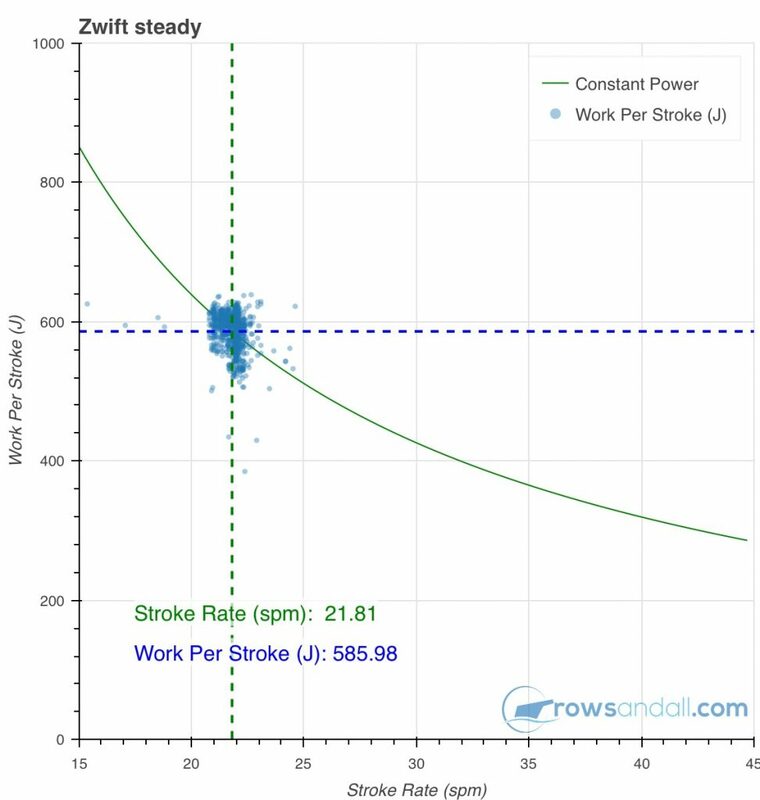 I guess Rick from Painsled did that to make sure that an average rower keeps up with an average Zwift cyclist. The fun thing about Zwift is that your ride/row with other people. I used to do that with RowPro, but that was very static. 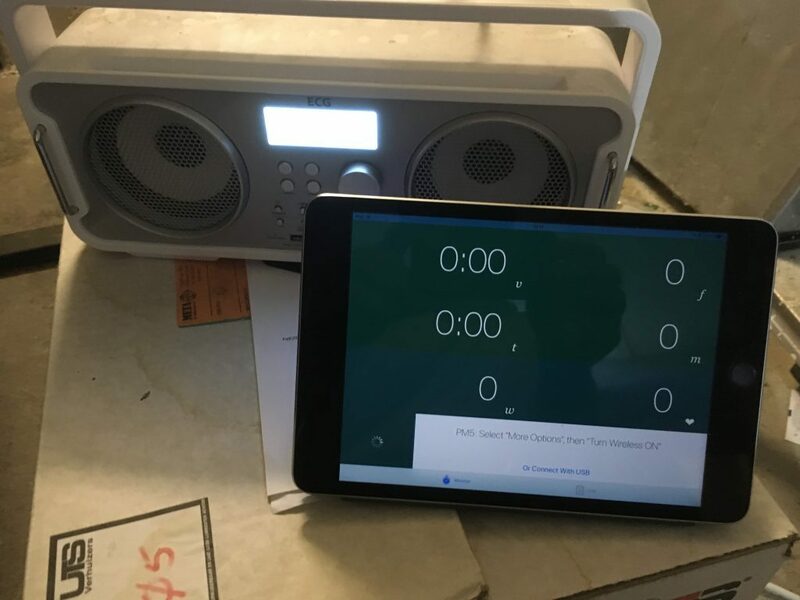 You had to make sure there was a scheduled row, and you had to adhere to the agreed start time. If you were late, you rowed alone. 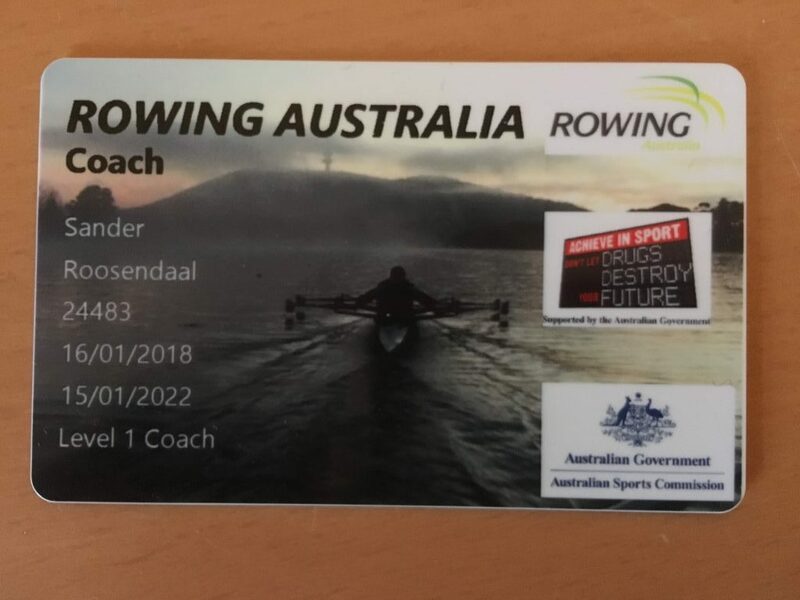 Also, because everybody started at the same time, and people have different rowing speeds, most of the time I ended up rowing my steady state alone, with some crazy fast people in front, and some slower people behind. Not on Zwift. You basically join when you are ready, and you just see other folks riding along in the streets of the artificial world. You see a guy riding in front of you, close the gap and pass him. Or, you are passed by someone fast, and you pick up the pace a bit to try and stay with him. 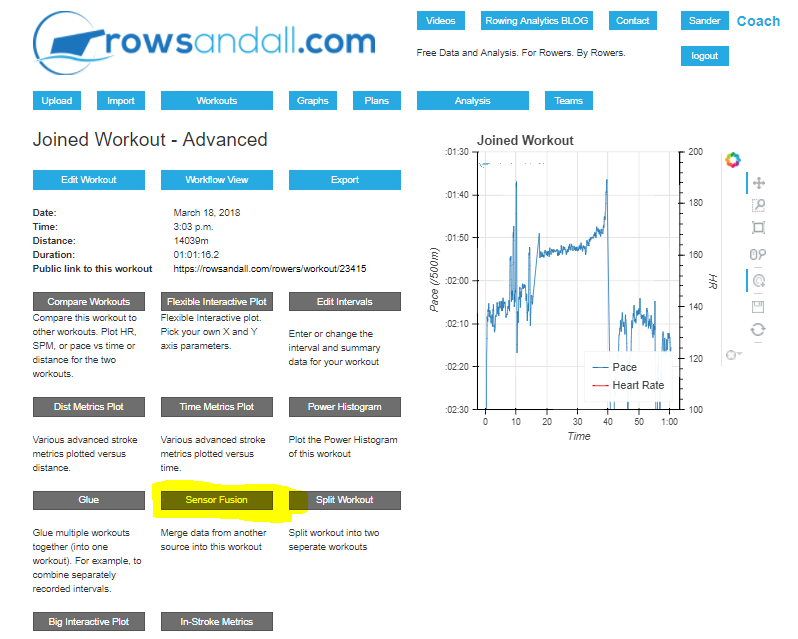 As the row is captured using Painsled, at the end of the row, I just mail the workouts to workouts@rowsandall.com. Interesting training session. It wasn’t too hard, but it was clearly in the threshold power range, and it was a good workout. Great. But it is more interesting to look at some charts. That’s about it. Pretty good. There isn’t much to add to the how-to sections of the other workouts of this week. 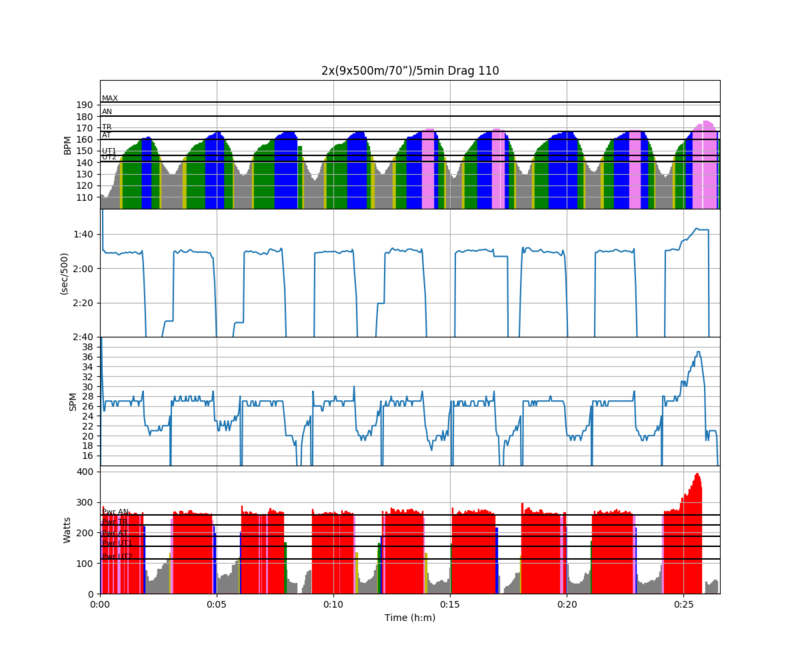 I used Painsled on the iPad, connected to my PM5 on a static Concept2 model C ergometer. 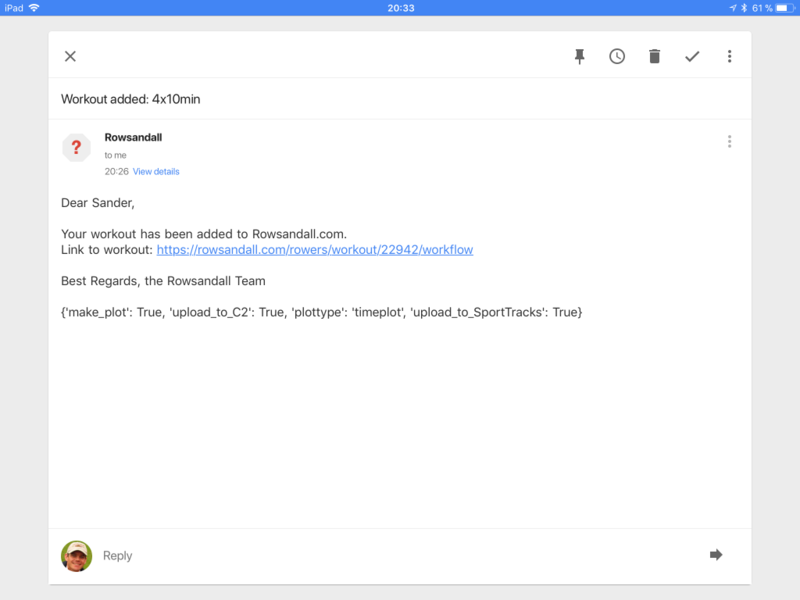 After the workout, I emailed the files to workouts@rowsandall.com. Once I received the confirmation email, I opened the main session on rowsandall.com. I opened the workout in “Workflow View”, a configurable page on rowsandall.com. On the left, there is a navigation bar which you can configure to your liking. I have added “Edit Intervals” near the top. 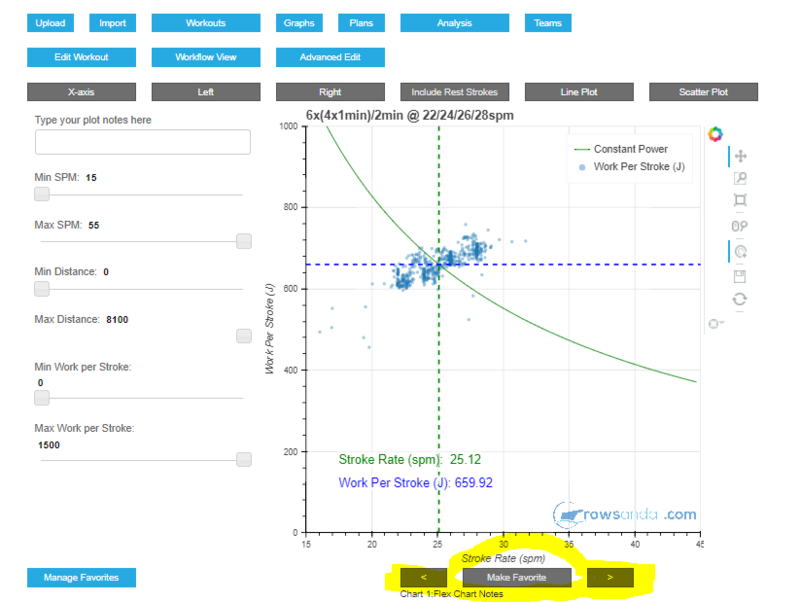 That is where I go, and submit “6x(1min+1min+1min+1min)/2min” as the workout description, which nicely separates the rest strokes from the workout strokes and tidies up the workout summary. The original summary auto-generated based on Painsled’s CSV file was pretty good, but as it is stroke based, you end up with intervals that are 3:58 minutes long instead of 4 minutes exactly. I take a quick look at the thumbnail of the session chart, which was created automatically because I put “chart time” in the body of the email. I have highlighted the navigation buttons on the bottom, which allow me to navigate between my pre-defined favorite Flex Charts. 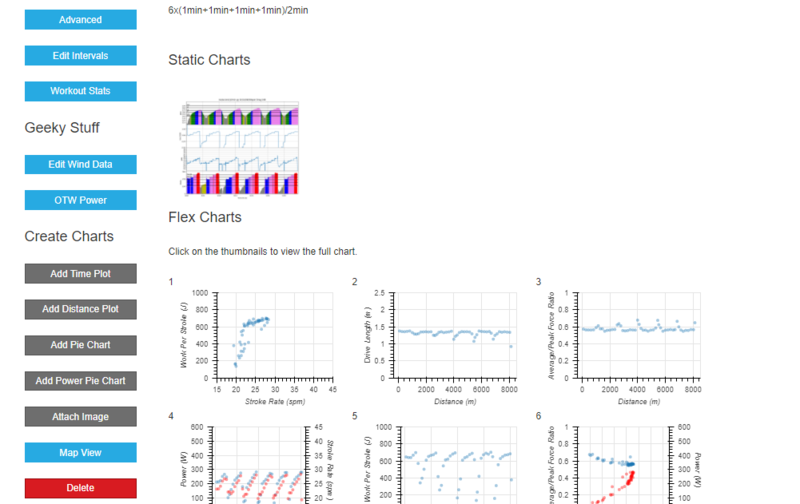 Of course, on each chart I can use the sliders on the left and the toolset to the right of the chart to interact with the data. These charts are interactive! 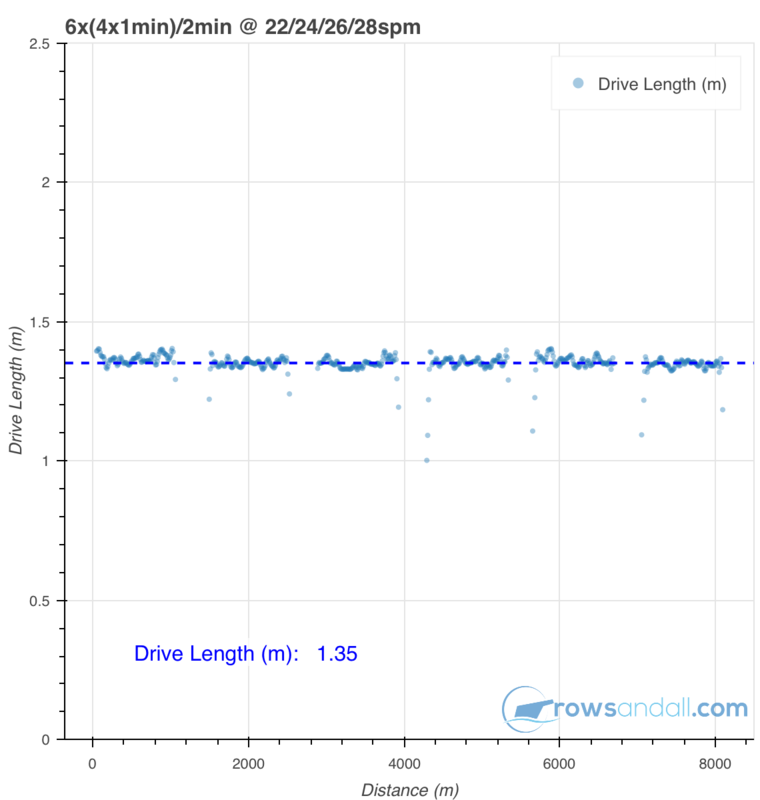 One of the charts is Drive Length. I use it to check that I didn’t do any wild things in terms of stroke length, such as starting to short slide when things get tough. Today, I didn’t. 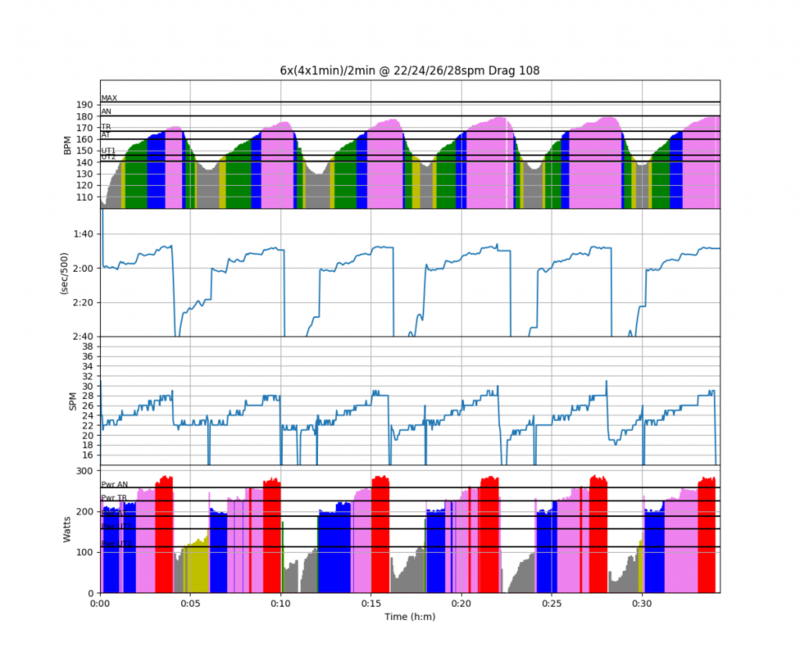 Easy threshold training – does it exist? A day off. We had business visitors over and I took them to a restaurant. I needed the rest day. 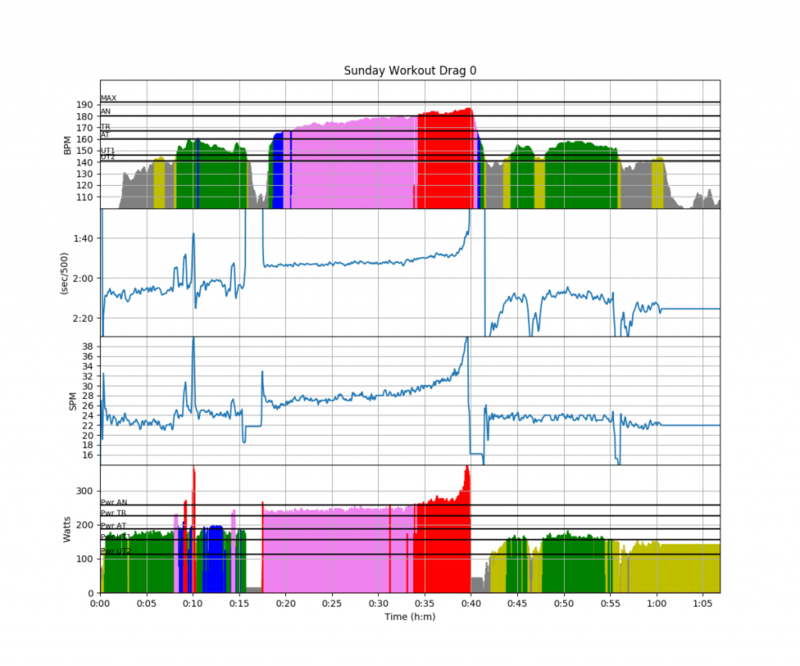 Lots of DOMS after the enthusiastic but unplanned longish run of Sunday, and my HRV data didn’t look too good either. 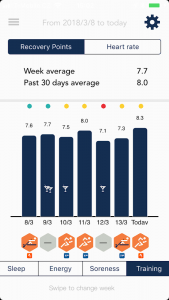 Here you have the data from the HRV4Training app. Look at the line of colored dots. A drop from 8.0 (which already isn’t a really good value) on Sunday morning to 7.1 on Monday morning. 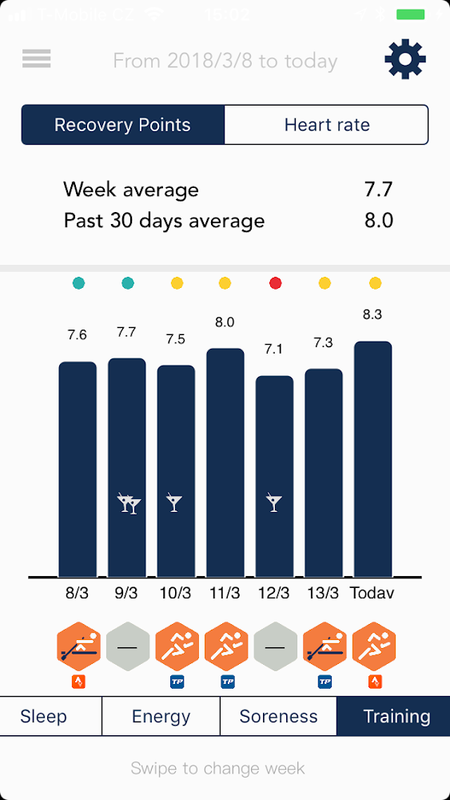 Unless this is shear coincidence, the HRV4Training app is starting to produce some convincing evidence that it is able to give me a heads up on accumulated fatigue, which is great. That doesn’t sound too taxing, and I was even wondering if it is really a threshold session, or more like a “black hole” session, or a slightly more intensive steady state. Well, it turned out that my heart rate got quite high. I was glad that the final 2 minute and 1 minute parts were over fast, and with every interval I had more difficulty holding good form and posture in the 20 and 22 spm bits. 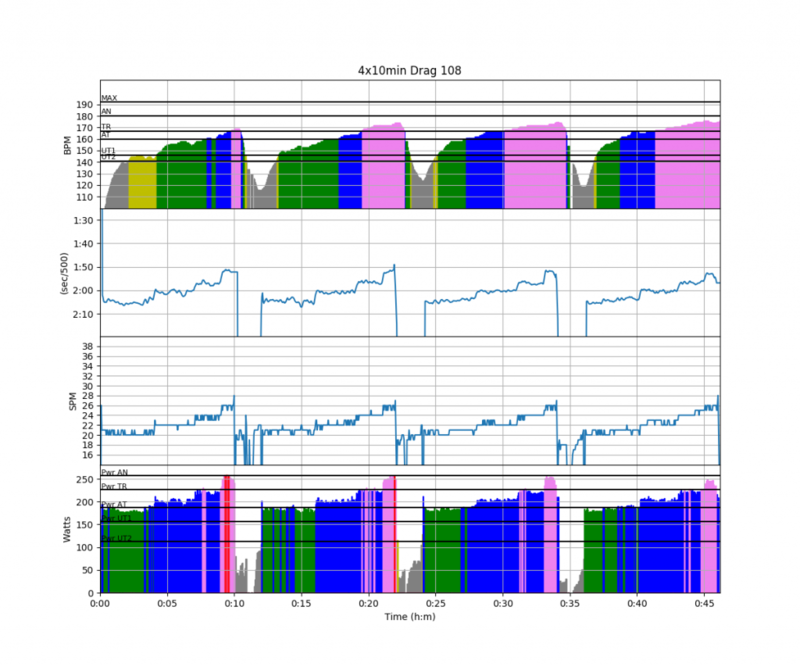 Ideally, in these rate ladder sessions, you should row at constant Work per Stroke, but somehow I was increasing the work slightly at higher stroke rates. Should I have pushed harder at 20 spm? I managed to motivate myself to make a stop at the pool on the way to work. I hit the water a bit later than normal, around 7:20am, and as I always leave the pool at 8:00, no matter how long I have been swimming, in order to arrive at work at 8:30, today I had only 45 minutes of swimming, or 1500m. In my hurry, I had forgotten to take a towel, which I discovered while walking to the pre-swim shower. I spent a few seconds hesitating in front of the 28C shower, wondering if I should give up and just go to work. No, I was going to take that 28C shower (fresh) and start swimming, and in the first few lanes I would figure out a plan. It turned out to be pretty easy. My cloth swimming bag proved to be a pretty effective towel. No, that is not a very glamorous environment. It’s a small room in our basement. The black hole in the back is a door, which I open to let in fresh air. In the right corner, on the water pump box, you can see a Raspberry Pi. It is not in use at the moment. An abandoned project. 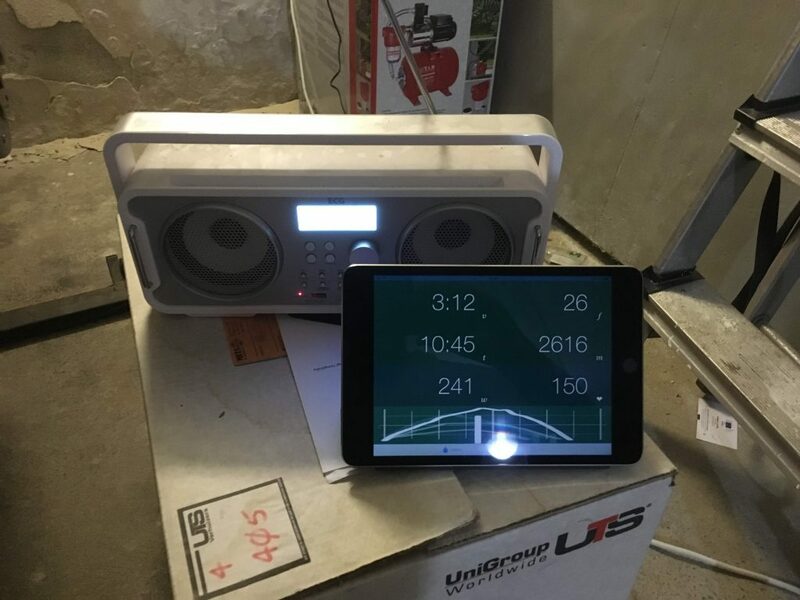 More important are the box close to the erg, with a radio/USB speaker combo, and the iPad. You need to repeat these steps at the start of each session. You can use the PM as normal. Each time you press the Menu button to start a new workout or Just Row, Painsled will save the data, but you can safely ignore this and just focus on the PM5. After the session, it is time to get the data out of Painsled and to Rowsandall, Concept2 logbook, SportTracks and other places. 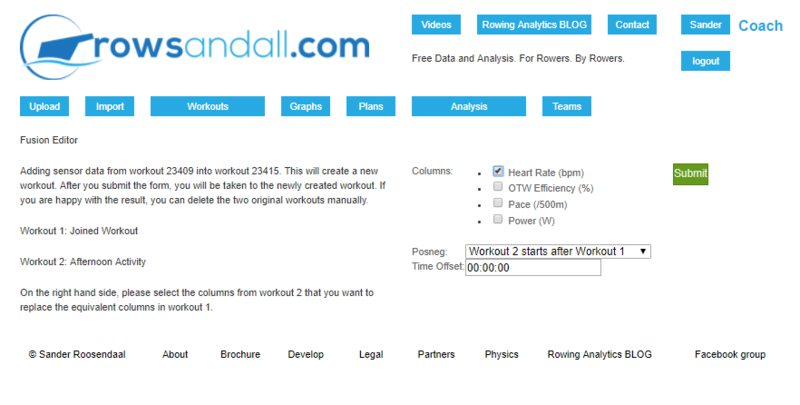 Now, I can start looking at the workout data on rowsandall.com. Here is what I look at. For the swimming session of today, I use the Polar OH1 in standalone mode, and then sync it with the Polar Flow app after the swim. This will get the data on Strava, from where I can import them into Rowsandall.com. The only thing I do is link it to my planned session, and that’s it. In the morning, I finished the work on my latest rowsandall.com release, and released it. Then I sat around waiting for bug reports to come in, but nothing happened, so I went to do the groceries. Well, I guess I had test driven this release quite thoroughly on the development server, so there was no reason to be worried. The whole event was really quite uneventful. It is funny, how the same session can be so different. I guess this had a lot to do with two rest/travel days and an easy treadmill run that I did in the past days. I had planned for a steady state erg, but the weather was so nice, so we went for a walk to check the ice on a nearby pond. Robin, my youngest, got so enthusiastic to go skating in the afternoon that I decided to join him. 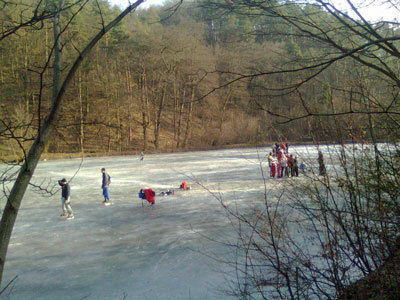 While the Czechs were still enjoying their traditional long Sunday lunch, we were already out on the ice. This was on purpose, because with my speed skates I need a bit of space. Still it was quite claustrophobic. A kilometer was about four loops on the small pond, and I did 15km in total. By the end, there was a small crowd on the ice, mostly playing hockey, so I had to go. Robin remained and is still enjoying the sunny winter afternoon.